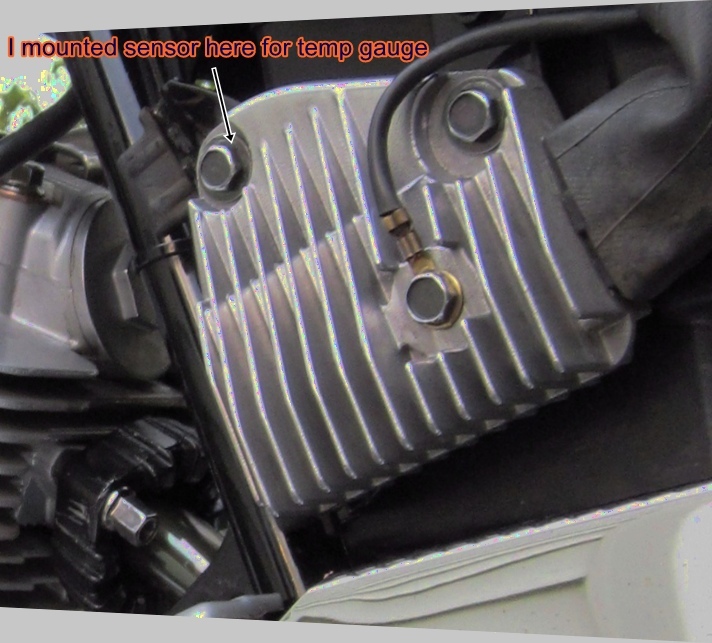 Voltage regulator TEMPERATURE – Virago 250 – Does yours run too hot? Voltage regulator TEMPERATURE – Virago 250 – Mine stays cool if bike is moving, but gets too hot in stop-and-go traffic or idling. I recently added a temperature gauge to my Virago 250 voltage regulator. The voltage regulator on some Virago 250’s runs too hot – it is good to be below 120° F or 47° C. At this temperature, it will burn you if you hold your hand on it for a few seconds. At 79° F ambient – on the highway at 65 mph, the voltage regulator ran at 106° F to 109° F.
When I slowed down it went up to 112° F.
When it became breezier, it went down to 103° F.
At 70° F ambient – at 50 mph, it ran at 93° to 96° F.
At short red lights, it went up about 5 degrees F.
At longer red lights, it went up about 10 degrees F.
Do not idle the Virago 250 for more than about a minute, if possible. The voltage regulator will get too hot – idling for 3 minutes it will go up to 142 degrees F or more. At 26° C ambient – on the highway at 65 mph, the voltage regulator ran at 41° C to 43° C.
When I slowed down it went up to 44.4° C.
When it became breezier, it went down to 39.4° C.
At 21° C ambient – at 80 kph, it ran at 34.0° C to 35.6° C.
At short red lights, it went up about -15 degrees C.
At longer red lights, it went up about -12.2 degrees C.
The voltage regulator will get too hot – idling for 3 minutes it will go up to 61 degrees C or more. These are just ideas at this point – I am going to try them to see if they help. 1) Attach another heat sink to the voltage regulator. 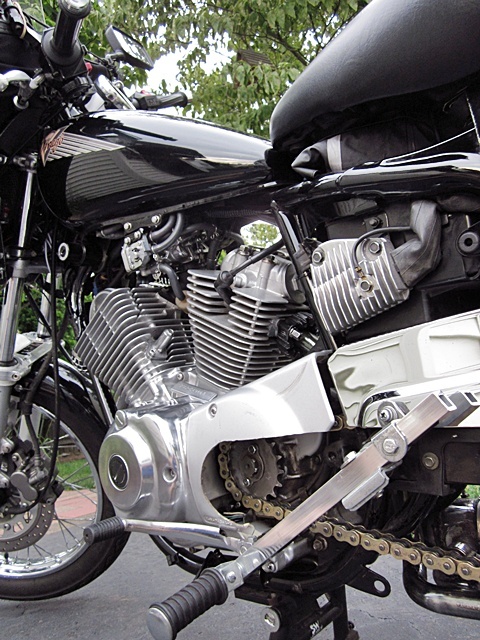 If you have an old Virago 250 regulator, try that – it should fit great – mount it underneath the regulator, base to base – you want to get as much metal to metal contact as possible. 2) Leave the left plastic sidecover off. Use sealant on the electrical connector. 3) If you need to idle your bike for more than a minute, put a fan on it. This will help the engine run cooler as well. 4) Put a piece of plastic above and slightly ahead of the regulator to serve as a wind deflector to direct more airflow to the regulator. 5) Put spacers or washers under rear of regulator to angle the rear out so it will get more airflow. I added lower fairings to my Virago 250, and the voltage regulator ran 14% hotter (when bike is moving). Tips to help make your Virago 250 a little faster. 25 PSI Front / 29 PSI Rear – for up to 90 KG (198 lbs) load. 29 PSI Front / 32 PSI Rear – for over 90 KG (198 lbs) load. This entry was posted in Uncategorized and tagged Virago 250 electrical, Virago 250 electrics, Virago 250 hot, Virago 250 modifications, Virago 250 mods, Virago 250 voltage regulator, Voltage regulator too hot. Bookmark the permalink. 2 Responses to Voltage regulator TEMPERATURE – Virago 250 – Does yours run too hot? I have virago vx 125 1995 model. My regulator is damaged and could not get one in the place where i stay. I managed to get a regulator of kawasaki ninja 250 . Is it compatible with virago 125. Please advice. Sorry – I do not know if the Kawasaki regulator will work on your Virago.